For your ease and convenience: Every machine accepts CASH/COIN/CREDIT/DEBIT…no cash, no problem, swipe your card and select your healthy snack or beverage. We use the latest technology with Remote Machine Monitoring to ensure you’ll always have the products you want available. We monitor the activity of our machine via cellular technology (DEX reporting) to track sales, product activity, and machine status. Our machines are built environmentally safe and electrically efficient. The cooling system is CFC free and utilizes the newest refrigeration components. The machine has all LED illuminated product windows to conserve electrical power consumption. Our machine operational cost is better than the minimum requirements to meet Energy Star standards. 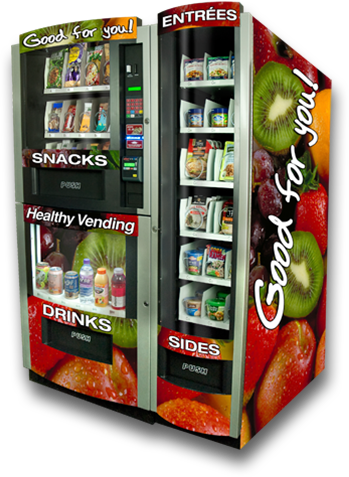 Want to save money at your facility – replace the worn out “Brown Box” vending machine with a new Health-E Vend Unit!